It’s allergy season, which means those of us with asthma are huffing and puffing. Here’s the perfect Throwback Thursday post from a couple of years ago. To see all the latest posts and more info, be sure to “like” greenmomster on Facebook. So what triggers asthma and asthma attacks? First off, asthma is a family affair. Children with parents who have asthma are more likely to have asthma themselves. A predisposition for having asthma has been found to be passed down genetically. Now, just because a person has a predisposition, that doesn’t mean they’ll actually get the disease. But if they do, what might set off an asthma attack? Allergies often lead to asthma (dust mites, molds, pollen, etc). Virus and bacterial infections can lead to asthma symptoms (often, a person with asthma will begin to wheeze or cough if they get a cold). Some people have exercise-induced asthma. Others get asthma attacks due to certain foods or drugs. But asthma can be triggered by something else. Asthma can be triggered by pollution. 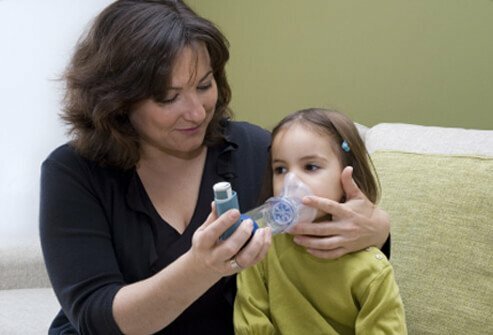 Pollutants such as particulate matter, sulfur dioxide (SO2), and ozone (ground-level ozone, that is) have been shown to increase the occurrence of asthma attacks, particularly in children. What types of activities produce these pollutants? The small particles that might affect the lungs are produced from the chemical reaction of pollutants from power plants, industries, and automobiles. Sulfur dioxide is most commonly produced from the burning of fossil fuels (coal and oil), as well as cement production. Ozone isn’t usually emitted directly as a pollutant; it’s formed by the action of sunlight on NOx which comes from car exhausts, fuel combustion, and industrial processes. Beginning to see a trend? The pollutants that cause the most problems for asthmatics come from our cars and our power plants. Limiting discharge of pollutants will protect children and other people affected by asthma. Will it raise our fuel costs? Possibly. There’s some conflicting information as discussed by the Edison Electric Institute and the Congressional Research Service. Full disclosure, my husband works for an energy company, so I’ve heard both sides of the argument. But let’s look at it this way – someone has to pay. Should we, the users of cars and power from fossil fuels, each pay a little more for a cleaner environment, or should we ask the payment to be made by the most vulnerable – our children, individuals living below the poverty level, the elderly? My son’s asthma is controlled with medicine and attacks are infrequent, but others are not so lucky.